White Alley is a natural monument of ancient Eskimo origin on Yttygrane Island, located in the Strait of Senyavin off the southeastern tip of Chukotka. Source: Getty Images. Parks, caves, plateaus, and bays are among the contenders for inclusion in the UNESCO World Heritage list. Although deprived of global attention, these sites are nevertheless captivating. This is the second-largest bay in the world, surrounded on all sides by fells and snowy mountain peaks. Avacha Bay is so large that it can accommodate all the world’s naval fleets. It also offers a view of the Koryak, Avachinsky and Vilyuchinsky volcanoes. At the entrance to the bay stands the “Three Brothers” rock – an official monument of nature, as well as the symbol of Avacha Bay and the city of Petropavlovsk-Kamchatsky. One of nature’s unique monuments, this cave was formed by the Great Perm Sea. Scientists estimate that it is 10,000-12,000 years old. Today, experts consider Kungur Ice Cave to be the world’s only gypsum cave with extensive glaciation, as well as the seventh-longest ice cave in the world. Each year, it is visited by more than 10,000 tourists. Valdai National Park was created in order to preserve Seliger, a unique system of lakes and forests of glacial origin. Seliger is described as the “pearl of Russian nature.” It is located between Moscow and St. Petersburg, amongst the forests of the Valdai Hills that lie approx. 225 miles northwest of Moscow. The lake’s area is 100 square miles, of which Seliger’s more than 160 islands make up nearly 15 square miles. Baskunchak is a unique natural depression at the top of a huge salt mountain, covered with sediment and penetrating miles into the earth. The largest and most famous of all the world’s salt lakes, it is 3.7 miles deep and about 44 square miles in area. Baskunchak is located in Astrakhan Oblast, 33 miles east of the Volga River. Belukha Mountain, revered by locals as a sacred mountain, is located in the Ust-Koksinsky region of the Altai Mountains. It is the highest point in Siberia, at an altitude of 2.8 miles. These giant stone statues located on the Man-Pupu-Ner Plateau in a remote area of the ​​Northern Urals in the Komi Republic were formed by selective weathering of the surrounding rocks. With a total of seven pillars, each rising around 100-130 feet high, the Man-Pupu-Ner Plateau is a popular site for sports tourism. This unique structure is a natural monument of ancient Eskimo origin on Yttygrane Island, located in the Strait of Senyavin off the southeastern tip of Chukotka. 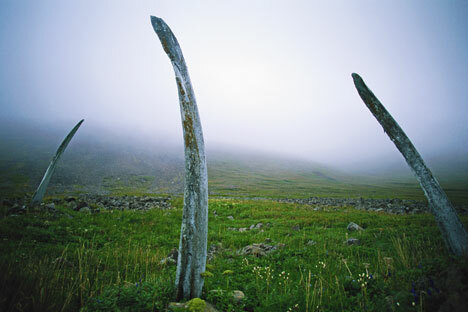 The structure was formed by two rows of enormous bowhead whale bones dug in by the shore. The dimensions of the alley (running 164 feet along the northern coast of the island), along with its complex structure, are truly amazing. The “Krasnoyarsk Pillars” State Nature Preserve is located 2.5 miles from Krasnoyarsk, on the banks of the Yenisei River and in the spurs of the Eastern Sayan Mountains. The “pillars” are volcanic rocks of gray-pink syenites stone, rising high above the beautiful mountain taiga. The rocks here are roughly 100-300 feet high. Many centuries of battle against water, wind, and temperature fluctuations have produced some bizarre shapes. Almost all the rocks are named after their appearance: “Feathers,” “Lion Gate,” “Grandfather,” “Elephant,” and “Chinese Wall” are just a few of them. The Kuril Islands are home to around 40 volcanoes – some active and many extinct. The region’s lakes are renowned for their extraordinary beauty. The southern part of Kunashir Island (1,775 feet above sea level) is home to the boiling Ponto Lake inside of the Golovin Volcano caldera. The water seethes and bubbles, releasing jets of gas and vapor that whistle over the coast. In 2005-2006, a study was conducted of the volcanism on Kunashir Island. Scientists discovered that the lake formed as a result of a phreatic explosion in the center of the caldera, which produced a crater (nearly 1,150 feet in diameter) that then filled with water. This island in the Arctic Ocean, located at the intersection of the Western and Eastern hemispheres, is divided into two roughly equal parts by the 180th meridian. In 1976, Wrangel Island Preserve was set up to study and protect the natural systems of the Arctic islands, including the small neighboring island of Herald. The island is about 2,960 square miles in area, of which about 1,850 square miles is covered by mountains. Small glaciers, average-size lakes, and Arctic tundra are also to be found here. Between the ridges run valleys with numerous rivers. The island is home to more than 140 rivers and streams (each more than 3.3 miles long) and five rivers that stretch for about 165 miles. Mount Elbrus, located in the Caucasus, is in fact not only a mountain, but a composite volcano. It serves as the highest mountain in Russia, with two lofty summits: the western peak stands at an altitude of 18,500 feet, the eastern at 18,440 feet. The last eruption dates back to 50 B.C., give or take 50 years. Because of its symbolic value as Europe’s highest point, Elbrus was the scene of fierce fighting during World War II, which involved units of Germany’s Edelweiss Mountain Division. Located in the south of Tuva Basin, this lake lies on the border of Russia and Mongolia in a closed basin, with no external drainage and flanked by Jurassic-era sand and clay rocks. The basin itself is surrounded by a rolling, treeless plain. Since 1932, the lake has been the site of a resort, where the main attractions are therapeutic brine and mud.